During your day to day operations, you’ve no doubt encountered several spills of various oils and products for your business. Whether you’re a quick lube with open oil containers and other automotive fluids sitting around the shop or a manufacturing plant with grease and hydraulic oils routinely used across your machinery, a spill and stain maintenance routine is a must. Having a clean up procedure in place will ensure a spotless facility, less risk of slips and falls, and help eliminate product contamination. Maintain your facility with Oil Eater® cleaning solvents to banish these three common pesky commercial, automotive, and industrial stains from nearly any material the spill occurs on, including carpets, upholstery, metal, concrete, and even clothing. Automotive Engine Oils: Engine oils are likely to spill, especially because of drained oil in various open pans. Hoses with new oil are likely to leak to some degree, as well as unintended spills along the way. Keep high alkaline Oil Eater® Cleaner & Degreaser Original Formula on hand to wipe away these stains quickly and effectively. Hydraulic Greases: As machinery runs throughout the day, in most cases 24/7, downtime for clean up maintenance is nearly nonexistent. 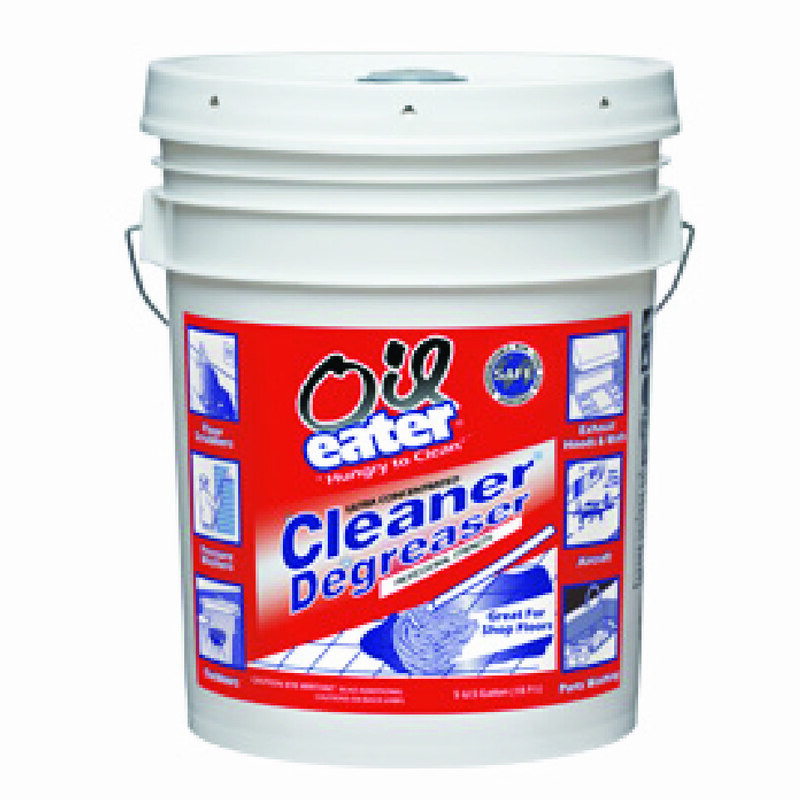 With the Oil Eater® Cleaner & Degreaser Original Formula, you can clean excess grease and spills easily without extra elbow grease and lengthy cleaning processes. This formula breaks down grease quickly and easily, leaving you with clean machinery and extra time in your day for other projects. To make your clean up even easier, snag an Oil Eater® Industrial Duty Spill kit that includes several pads and pillows to soak spills, as well as protective gloves, snakes and booms to control spills, and a bonus 5-gallon bucket of Oil Eater® Cleaner & Degreaser. Diesel Exhaust: As your fleets travel the interstates, the diesel fueling them leaves awful exhaust residue on the outside of the trucks. Even more, most trailers are white, making the residue even more unsightly. With your company logos emblazoned across your trailers, the last thing you want from a branding standpoint is to have a fleet of dirty trucks. Oil Eater® Fleet Wash will keep your fleet spiffy. More importantly, having an emergency Oil Eater® Commercial Duty Spill Kit on hand helps keep your trucks DOT-compliant. These are just some examples of spills and stains that Oil Eater® can make a non-issue for your business. Oil Eater® is safe, pleasant smelling, and effective enough on nearly all surfaces, making a stocked supply necessary. Don’t let your facility or equipment be caught in a spill with nothing to clean it up with. For more information on other Oil Eater® products that can provide value for your business, contact your current Sales Rep or fill out the form, here.